Coach Nick has been with the Tribe since 2011. A Chevy Chase native and Bullis alum, Nick went on to play at Kenyon College in Gambier, OH. He also holds a MBA from Lynn University. After Kenyon, he headed off to Sweden to play for the Orebro Eagles of the Swedish Independent League and led them to a championship. Upon finishing his playing career, he worked for RBI Baseball in DC as a program coordinator and coach at Charles Hart Middle School. 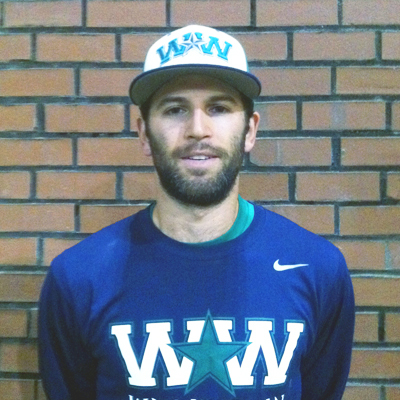 After his time with RBI, Nick headed out west to join the coaching staff at San Diego City College before ultimately moving to Claremont, CA to coach at Pomona College. In his three seasons as the hitting and 3rd base coach, the Sagehens compiled an 83-35-1 record and made it to the Division III Western Regional in 2010. In addition to the numerous all-conference and regional awards his players received, Nick was also able to work with two future MLB draft picks. While he loved his time in college baseball, Nick truly enjoys working with young players and seeing them mature both as people and ballplayers. While winning is important, it is not the only way he defines success. Making personal improvements, learning the value of hard work, dealing with failure gracefully, demonstrating sportsmanship, and being a great teammate are all ways that we win. Our longest tenured coach, Matt has been with us since 2010, working with players 8 through 14 proving himself instrumental in the development of our youngest ballplayers. He loves coaching because he enjoys working with kids and having the opportunity to provide instruction and see them learn and then apply those skills. While winning is great, Matt finds it equally rewarding to watch a player grow and improve over the course of a season. His coaching experience also extends to IAC middle school baseball as a member of the 7th Grade St. Albans staff. He played ball at Amherst College as a third baseman in the competitive NESCAC. When Matt is away from the field he works at the National Democratic Institute on its programs in Latin America and the Caribbean, working to strengthen democratic institutions and good governance throughout the region. He also enjoys watching and playing sports, touring the DC sites, and travelling when his busy schedule allows it. A Tribe coach since 2010, Curtis loves to coach our ballplayers because it allows him to help build the competitive and personal foundation needed to excel in sports and more importantly, life. Curtis’ playing career began at the University of Alabama and finished at Southern University, Baton Rouge. He credits his coaches for helping to shape the person he is today by teaching him how to conduct himself as a student-athlete both on and off the field. When not on the field, Curtis works as a financial consultant and enthusiastically roots for Alabama football. Roll Tide and Roll Tribe! Shyrone has been with the Tribe since 2011 and is also a physical education teacher at St. Patricks in Georgetown. He played baseball at Virginia State University and spent time coaching there once his playing career ended. Shyrone still laces up his spikes and plays competitive baseball in a wood bat league in Northern Virginia. Outside of baseball, he plays basketball, does stand-up comedy, and spends time with his wife and three children. Scott joined the Tribe in 2010 and has worked with a variety of different age groups during his tenure. Prior to joining the WWB, he worked as an assistant varsity baseball coach for nine seasons at Blacksburg High in Virginia. When away from the field, he is a Physical Education teacher in the Montgomery County Public School system, spends time his with his wife and 6 month old son, and loves to root Virginia Tech football.